Cedar Mill, like other frontier communities, developed with the partition of the Oregon Country, the westward movement, the establishment of the Oregon Territory, and the laws that provided free land for the settlers. Until 1846, the ownership of the region remained in question. British fur trading interests, represented by the Hudson's Bay Company, dominated the economic structure of the area. The only Americans were a small number of mountain men who turned to farming when the market for beaver pelts diminished. Simultaneously, missionaries from the East formed a few scattered settlements, followed by small groups of farmers. By 1841, several families had crossed the plains to establish farms in the Tualatin Valley. Back in the states, Oregon enjoyed a growing reputation through the 1840s for its productive farmland, its healthy climate, and its abundant waterways. As interest about the region mounted, so did the number of wagons crossing the plains. The westward movement to the Willamette Valley began in earnest with the Great Migration of 1843 when wagon trains brought over 800 pioneers who risked the hardships of the Oregon Trail to settle in Western Oregon.English partisans viewed the growing American settlements with alarm. A last minute attempt was made to establish a British foothold when the Hudson's Bay Company sent 39 families in 1841 from the Red River colony in Manitoba to the Puget Sound and Cowlitz areas. Finding conditions there unsuitable for farming and the Company's terms ungenerous, the recruited Canadians moved to the Tualatin Valley and joined the former Hudson's Bay Company employees who were already living there. The Americans remained unintimidated and, as more wagon trains continued to arrive, British subjects were soon outnumbered. In 1843, Tualatin Plains pioneer Joseph Meek participated with a group of Americans in establishing a provisional government for the Oregon Country. Three years later the boundary issue was peacefully settled, fixing the 49th parallel as the dividing line between Canada and the United States. After the question of sovereignty was decided, Congress acted to set up the Territory of Oregon in 1848. The year 1850 brought passage of the Oregon Donation Land Act. The pioneers already in the area had claimed "squatter's rights" to their holdings, but the new law provided for a Surveyor General to survey the territory for formal land claims. Settlers completing the filing process were then secured in legal ownership of their acreage. A maximum of 320 acres could be claimed by both men and women, making 640 acres available to a married couple arriving in Oregon prior to December 1, 1850. The legislation was later extended to 1855, although the individual claim size was reduced to 160 acres. Cedar Mill Donation Land Claims Map. Including women as landholders was a significant step in women's rights, as well as a means of encouraging whole families to make the arduous journey west. As a result, a number of bachelors married in the East and hurried to the territory; others who were still unattached took brides along the way in order to receive greater	acreage. The unoccupied land in Cedar Mill comprised 4,300 acres, or about seven square miles. From 1850 to 1855, sixteen claims were settled that covered nearly the entire area. Thirteen of these claims were owned jointly	by married couples. After 1860, when homesteaders took up two previously unclaimed parcels,	the population in the	area probably exceeded 650. The pioneers who left the area sold out claim by claim, as randomly as they had arrived. In 1884, only two of the donation land claim holders remained on their acreage: Samuel Walters, who was first to arrive in the immediate area, and James Flippin, who reach the	Tualatin Valley in 1845. 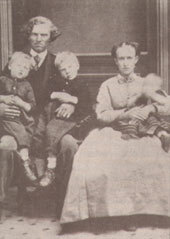 Samuel Walters, the original settled in Cedar Mill, came from Pennsylvania in 1847 to set up a squatter's claim and cabin near NW Leahy Road and 107th Avenue. At that time, his nearest neighbor was probably Colonel Hall, who had been living on his claim south of Cedar Mill	for several years. When news of the California gold discovery reached Oregon, Sam was among other early pioneers bitten by "gold fever." At age 29, Walters adventurously joined the southern migration. Unsuccessful in his search for gold, he returned to the area in 1851, bringing three waxen apple trees which he planted on his re-established claim. The following year, Walters applied for a donation land claim covering the 160 acres he was entitled to. Clearing the land was a difficult chore, but little by little, more acreage was made ready for the grain and food crops Walters harvested. He also supplemented his income by working for his neighbor to the east, Joseph Smith, receiving $.75 an acre for plowing Smith's land. Unlike other pioneers in the area who exchanged their free land for capital, Walters kept his entire claim for over 35 years with the exception of a one-acre tract he donated for the Cedar Mill school in 1884. The first Walters land transaction of record occurred in 1888 when part of the property was sold to Thomas Leahy. Several parcels were given away as wedding presents to the Walter's daughters, Nancy and Elizabeth, but the remaining acreage was owned by Walters	until his death in 1894.